The Wolf That Changed America - What’s Your Connection to Nature? 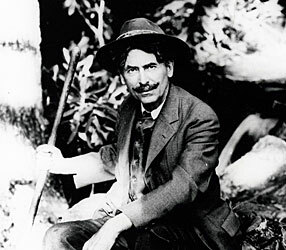 In 1893, Ernest Thompson Seton traveled west to New Mexico with a singular purpose: to kill the wolf named Lobo. However, as The Wolf That Changed America reveals, the time Seton spent there profoundly transformed his worldview. After Seton’s encounters with Lobo, he returned east and set about recording his adventure. But in the story he wrote, Seton himself is the villain, and Lobo is the hero. His book, Wild Animals I Have Known, became a worldwide success and turned Seton into a major celebrity. Seton found new purpose in speaking out against the destruction of America’s wilderness. He lobbied for the creation of new national parks, and fought for protections for wildlife. For Seton, it wasn’t just a question of saving the wilderness. He believed that people had to experience nature in order to care about it — that it should be a part of everyone’s upbringing. What’s your connection to nature? Why do you value it? Use the comment form below to share your own experiences of the natural world with NATURE viewers everywhere. Tell us your favorite stories and memories of the wilderness and wildlife around you.